This Nativity set is made from car polish spray cans. 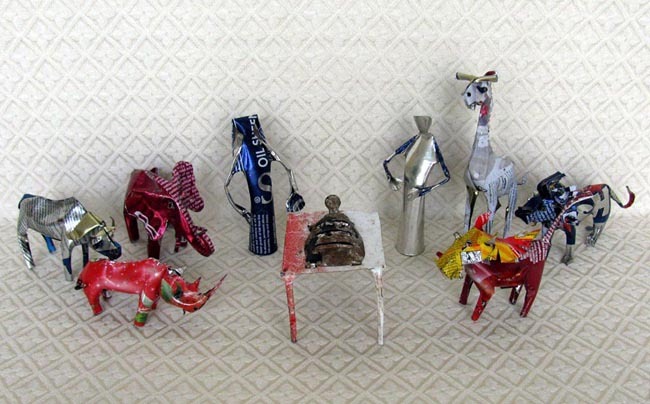 The set includes Joseph, Mary, baby Jesus on a bed, and six African animals: a cape buffalo, an elephant, a giraffe, a lion, a rhino, and a warthog. The Joseph figure measures 4.25 inches tall. The set was crafted by two men. In the early 2000s, George Zimba was one of the pioneers of this type of art in Chitungwiza, Zimbabwe. He is married with 3 kids and he currently lives in Chitungwiza. George works with his neighbor, Wonder King, who is originally from Mozambique. Wonder came to Zimbabwe in the early 1990s, fleeing the civil war in Mozambique. He is also married with 3 kids. These men employ extra artisans when they are working on huge orders, but work is hard to come by now (2016) in Zimbabwe with the civil unrest and antigovernment demonstrations across the country that are scaring away tourists.